When you mention Steel Magnolias to anyone most people instantly recall the 1989 film starring Julia Roberts and Sally Field that women across the globe fell in love with. Written originally as a stage play by Robert Harling in memory of his beloved sister Susan; the drama features an ensemble of six women, whose lives encompass so many different experiences it is hard not to identify with one of them. Set in Truvy’s Beauty Salon in small town Louisiana during the 1980’s, the salon is the mecca where ladies of the community come, not only to have their beauty needs tended to, but also to share the trials and tribulations that women of every age can identify with. The newly established Solar Theatre Productions kicked off the nationwide tour of this heart-warming play in the Gaiety Theatre, Dublin 2. Hollywood star Mischa Barton made her Irish theatre debut as the ill fated Shelby and Anne Charleston assumes the role of outspoken Ouiser, this production had high expectations and thankfully it didn’t disappoint. Despite playing a saccharine sweet character, not dissimilar to other roles we have seem her play, Mischa managed to captivate the audience as Shelby. Her Louisiana drawl carried well throughout her scenes and she commanded the stage in a way that did not overshadow her cast mates. As the loveable, sharp tongued Ouiser, Anne delivered one of the most humorous lines I’ve heard in a long time. The explosion of laughter as she announced “I’m not crazy, I’ve just been in a very bad mood 40 years!” proves that the audience thought the same! Mischa and Anne were not the only highlights of the show; the cast had the audience enthralled with their take on this witty play. Their brilliant one liners helped lighten the moments that had everyone in the Gaiety, even the token men that had been dragged along, holding back the tears. 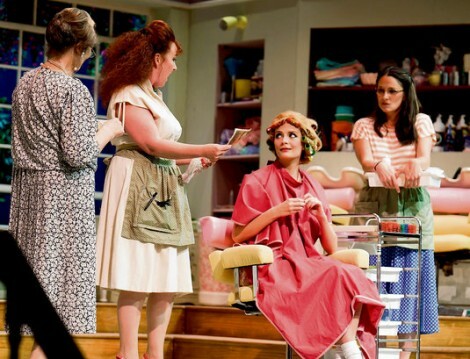 Steel Magnolias is touring the country until 19th October and promises an evening of fun, laughter and some tears, just don’t forget the waterproof mascara!